With a good diet and a considerate owner a dog need never be over weight. Like its owner an overweight dog is more likely to suffer from diabetes, joint damage due to the extra pressure on his joint and bones or even heart problems. He will lack a good quality of life and is more likely to die young. Sometimes obesity in a dog is a signal for other health-related problems. If a dog drinks too much, is always scavenging for food, has a lifeless coat, flaky skin or seems to be lethargic it is advisable to consult a vet. Nine times out of ten a dog is overweight because a loving owner over indulges him. Quite often the owner and dog are both overweight and if this is the case they should endeavour to follow a healthy life plan together. It is not necessary to weigh a dog to tell if he is overweight. The dog’s ribs should be just showing without being too prominent. Extra weight can also sit on the shoulder area of a dog so check that his shoulders are not too heavily covered in fat.If you want to weigh your dog first weigh yourself and note the figure. Next, hold your dog in your arms and step back onto the scales. Deduct your weight from the joint weight and you have your dog’s true weight. There is no need to weigh a dog every day, once each week is adequate. Stop all treats for your dog, he does not need them and quite often this alone will be enough to show a loss of weight. If you need treats in order to train your dog replace them with raw carrots, they are crunchy and dogs love them. Table scraps can also be a problem and add to weight gain. 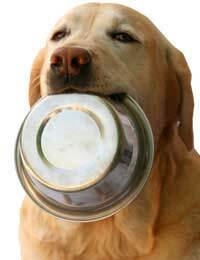 Stop giving your dog any fatty food from your plate and this includes puddings, pies and deserts. There is no need to purchase expensive prescription diets or buy drugs for an overweight dog. Simply cutting back and making a few changes will reap rewards. If you feed your dog with one of the many complete foods that are available on the market check that you are not over feeding the required daily amount. By giving half a cup less (or a few ounces) in one week you will see an improvement. By controlling what goes into your dog’s mouth you will soon see a happy healthy animal. A diet with uncooked/raw meat to which you add chopped vegetables rather than a mixer biscuit will also reap results. If your dog already has a mixer biscuit with his meat try swapping half of it with chopped vegetables. The bulk of the vegetables will still fill up the dog’s stomach but he will not gain the weight. Never give your dog raw onions or raw potatoes. Most other vegetables are acceptable including raw garlic. Chop the vegetables finely otherwise they will go straight through the dog and he will not gain the benefit of them. A food processor is excellent for cabbage, carrots, garlic, spinach, turnip, parsnip and squashes. Another useful aid is a juicer. Juice all the vegetables together then add both the juice and veg pulp to your dog’s meat. If you prefer using canned dog meat then add this instead of the raw meat. Never cook the vegetables as vitamins and goodness will be lost. Exercise will benefit both dog and owner. If your dog is unused to exercise do not start out on a long route march as it can injure an unfit dog. Start slowly and add five minutes extra each day until you find a comfortable distance that suits not only the dog but also yourself.